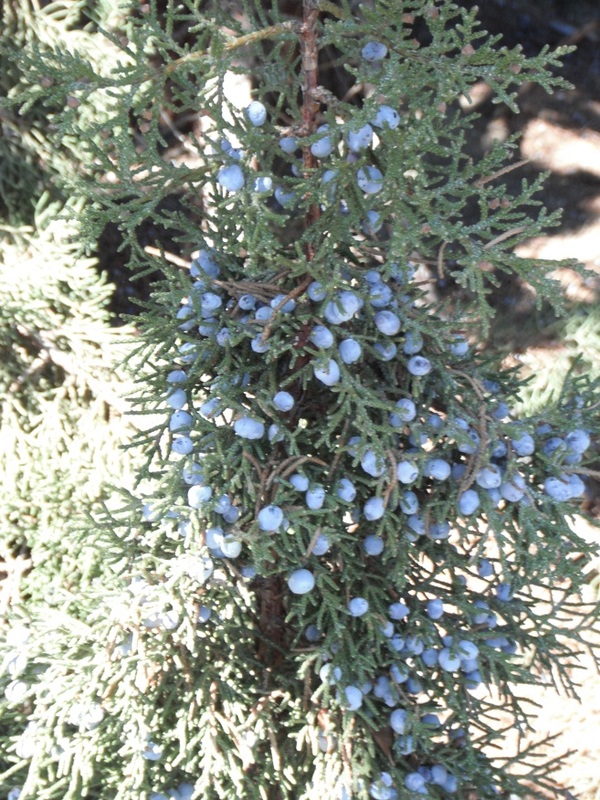 Names: Rocky Mountain Juniper is sometimes called Rocky Mountain Cedar or Mountain Red Cedar. “Scopulorum” means growing on cliffs. Distribution: The Rocky Mountain Juniper is widely distributed in much of western North America from British Columbia through the Rocky Mountains south to Arizona and New Mexico. 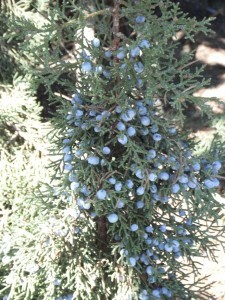 Growth: Rocky Mountain Juniper is one of 11 junipers in the United States reaching tree size. 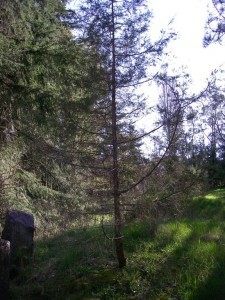 It is a small tree from 30 to 40 feet (10-13m) tall, with a rounded or columnar habit. It grows slowly and can live for 300 years. Habitat: In the Puget Sound, it is only found on dry, exposed bluffs of the San Juan Islands. Rocky Mountain Juniper tends to be a scruffy, sparse tree in west side gardens. Diagnostic Characters: Juvenile foliage is short, pointed needles in threes. Adult foliage is grayish-green and scale-like with opposite leaves in pairs. Female trees produce blue, waxy “berries.” The bark is red-brown, broken into shredded scales. In the Landscape: Although the species is not widely grown, there are several cultivated varieties, particularly columnar types. 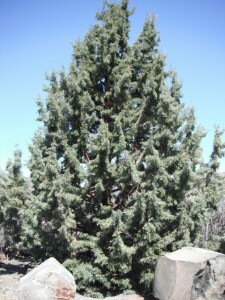 Rocky Mountain Juniper can be used as a small screening tree. Its grayish color and somewhat scruffy appearance can make an attractive contrast with greener, more softly textured conifers. It is useful for shoreline plantings because of its tolerance to salt spray. Its drought tolerance makes it especially appropriate for dry areas; in fact it should not be planted where it would receive too much moisture. Phenology: Bloom Period: Mid April to mid-June. Fruiting period: Fleshy cones, often referred to as “berries,” ripen in mid-September to mid-December the following year; seeds are primarily disseminated by birds, which eat the fruit in fall and winter. 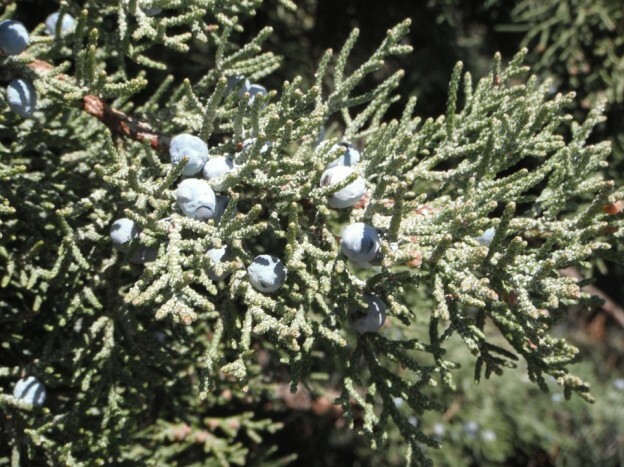 Use by people: The strong smelling roots of Rocky Mountain Juniper were boiled and used medicinally by natives for bathing and for disinfecting. Use by wildlife: Many birds, especially the Cedar Waxwing, enjoy the berry-like fruit. Small and large mammals eat them too. Hoofed browsers eat the twigs and foliage. The trees also provide protective cover and nesting sites. 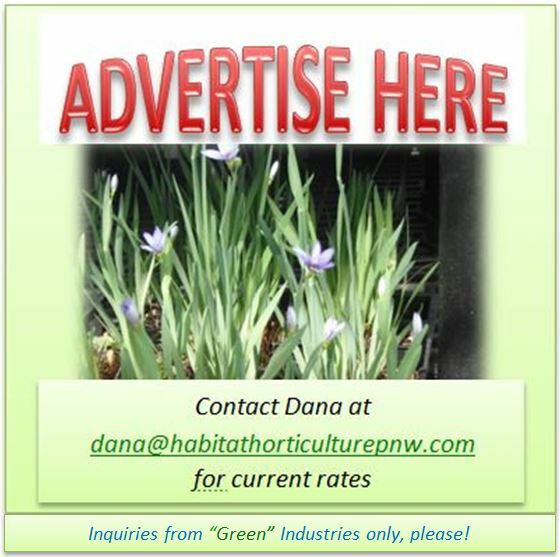 This entry was posted in Conifers on May 7, 2014 by habitatdana.